Stony Lake is a small inland lake along the West Michigan shoreline in New Era, Michigan. The lake is connected to Lake Michigan via the Stony Lake Channel, which is a small, river-like channel that travels around 1.5 miles until it reaches Lake Michigan. 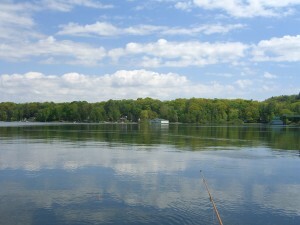 Stony Lake is home to many lakefront cottages and luxury lakefront properties. 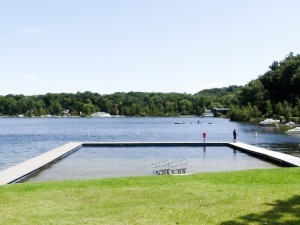 The lake itself is a perfect location for water skiing or tubing. Or, if you prefer to take a leisurely boat ride around the lake in a pontoon boat, Stony Lake will offer you great scenery during your boat ride. A popular campground on Stony Lake is Stony Haven Campground, which features community activities and a family friendly environment. One fun activity in the area is to inter tube down the Stony Lake Channel to Lake Michigan. 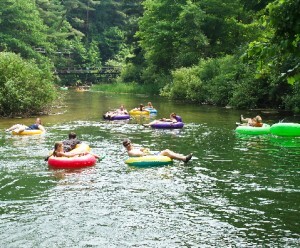 It is roughly a one-hour tube, but it is a great, leisurely activity to do on a warm summer day with the sun shining. There is plenty to do in the area of Stony Lake. It is near the Silver Lake Sand Dunes, which offer all kinds of activities from hiking to off-roading and parasailing. You can visit the Little Point Sable Lighthouse and climb up to the top and get a 100+ view of Lake Michigan and the surrounding area. There are also a number of golf courses in the area, including Grand View Golf Course, Benona Shores Golf Course, and the Oceana Golf Club. If you are interested in owning a home on Stony Lake, be sure to look at our Stony Lake listings page to see what is currently available in the area.